Leigh and Casey Isaacson, founders of the dating app Dig. 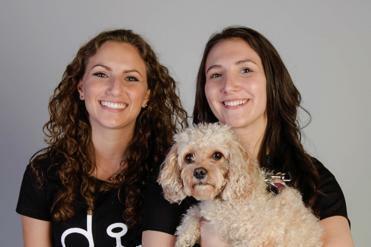 One of the latest apps to help us find love is Dig, a dating service that matches dog people. You don’t have to have a dog to join Dig — but you must love them. The service, based in New Orleans, was founded by Newton-raised sisters Leigh and Casey Isaacson, who believe that dog-friendly humans make good teams, in general. They’ll tell you that couples with dogs are better at handling stress, and how since 2006, pet ownership has increased by 28 percent among single men and 22 percent among single women, according to the American Veterinary Medical Association. “From the start, knowing that you’re meeting someone that’s also at least a dog person ... it starts you on that right path,” Leigh said, of why an appreciation for dogs is a good basis for match-making. The sisters launched their app before Valentine’s Day, and have followed up with parties across the country to boost membership. The events are dog-friendly and double as rescue opportunities. Boston’s free party is Thursday, July 19, from 6 to 8 p.m. at WeWork Fort Point. It will include food and drinks, portraits by dog photographer Lauren Dobish, dog costumes from Pet Krewe, amd dog-training demos by Gone to the Dogs. Also onsite will be PetsEmpower, an organization that helps pets find foster care during a crisis. For the Isaacson sisters, the Boston launch is big — because it’s home. It’s also where the company is finding support. Dig was invited to participate in the MassChallenge Boston accelerator program, which means it gets help with partnerships and mentoring opportunities. Boston is also an important city for the business, Leigh said, because compared to other locations, it’s not so great for dog owners. In Chicago, for instance, it’s easier to take a dog to public places, she said. Leigh recommends that once you meet someone on Dig — or at Thursday’s party — you bring your dogs on a first date. Meredith Goldstein writes the advice column Love Letters. Send letters to meredith.goldstein@globe.com.